Have you ever seen such a happy cow? Well, there's good reason why this cow is so happy. He's got all the grass he could ever eat, and with how long it takes for this guy to chew his cud, he might never run out of grass. His life consists of eating, sleeping, and slapping flies off his back with his long tail. He gets lots of attention because he's often mistaken for a celebrity cow from a certain popular fast food chicken restaurant. This cow also gets to mingle with all the lady cows in the field as part of his sleeping and eating deal. Now that you understand why this cow is so happy, what's stopping you from getting a piece of the action? You can't actually transform yourself into a cow (trust us, we've talked for quite a while with our team of scientists), but you can dress the part and maybe even pull a little inspiration from the happy cow in this Plus Size Happy Cow Costume. 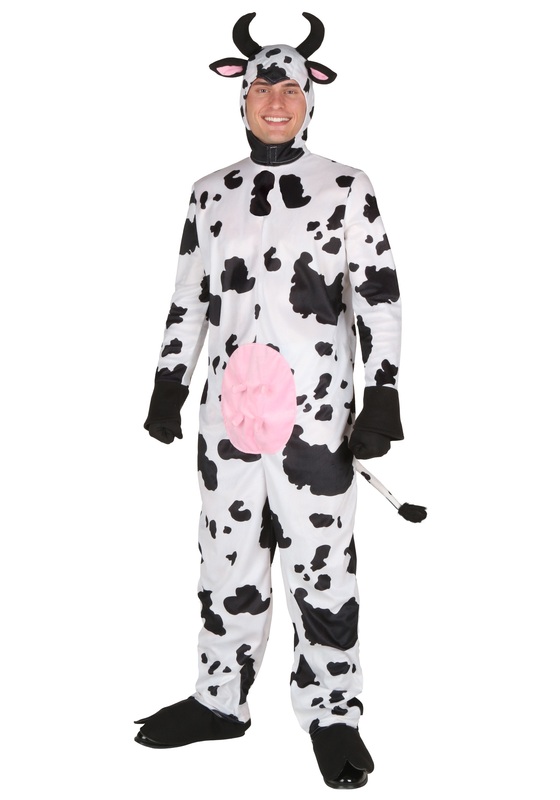 Everyone will be begging for moooooooo-re when they see you dressed in this plush cow costume. Now, this costume is 100% polyester and built to last. The spotted jumpsuit has a full zipper in the back with pink utters at the center of the jumpsuit. The headpiece uses Velcro to attach under the chin, and has plush ears and horns. Foot covers stretch over the ankles and an elastic strap goes under the bottom of the feet. Finally, there's a tail in the back of the jumpsuit. Grab yourself a glass of milk and you're all ready to head out this Halloween!